Double action. Cleans and wipes. Add your favorite detergent for best results Large dual sided scrubbing sponge for multipurpose usage. Green side for heavy duty scrubbing, yellow side for wiping. Ideal for tough, heavy duty jobs. Oval shaped for easy grip handling. Mildew-resistant. Ideal for washing dishes, glassware, tabletops, countertops and appliances. Foam always stays soft. Delicate scrubbing pads ideal for use on non-stick cookware, dishes, sinks and tubs. Rinses easily. Tear resistant. Teflon safe. Cuts through the toughest baked-on mess. Powers through greasy problems. Returns shine to your pots and pans. Removes rust stains. Waffle weave. 100 % cotton. Comes in 5 assorted colors. Kills 99.9% of household germs. Kills 99.9% of household germs. A quick and easy way to disinfect and clean household surfaces. The bleach-free formula cleans and kills 99.9-percent of the bacteria. The wipes can be used throughout the house, kitchen, and bathroom and disposed in trash after use. Removes tough marks and dust. Ideal for all surfaces, even the most delicate. Made with Extra-soft microfiber. Machine washable cloth. Wipe performance on one side and perfect polish finish on the other. Absorbent sponge core inside. Machine washable cloth. Highly abrasive texture ideal for tough scrubbing tasks. Durable material won?t rust. Retains its shape through many rinsing and washing cycles. Ideal for ovens, outdoor grills, tiles, pots and pans. Dishwasher safe. S.O.S. Juniors Soap Pad, For Small Messes Refill for lint roller SKU#470.4235. Made with Scotch Brand adhesive. Grabs tough to remove pet hair. 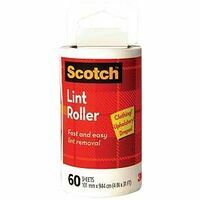 Effectively picks up lint and pet hair from clothing, furniture, auto interiors and more. Mini-size is great for travel and convenience. Soft microfibre side to remove grease and wipe surfaces. Scouring power zones to remove tough dirt without scratching. Machine washable cloth. Use to clean, polish and protect all stainless steel surfaces. These pre-moistened wipes clean stainless steel dishwashers, ovens, range hoods, refrigerators and outdoor grills. Quickly remove fingerprints, water spots and food stains. The formula contains a food-grade mineral oil which leaves a streak-free shine and helps protect from futures spots. Removes 90% of allergens on hard surfaces. Kills 99.9% of viruses and bacteria. Thick wipe cuts grease. Crisp linen scent. 35 count. Heavy duty scrubber sponge. Super absorbent sponge prohibits the growth of odor causing bacteria and mold. Durable and long lasting, and will remain odor free for the life of the sponge. Designed to tackle the toughest messes. 2 pk. Fill the Dishwand handle with dish soap and wipe away grease and grime. Teardrop head easily cleans corners. Fill the Dishwand handle with dish soap and wipe away grease and grime. Teardrop head easily cleans corners. Designed for fast and effective scouring of delicate surfaces. Ideal for bath, ceramic tile, countertops, glass cooktop and non-stick cookware. Fill the brush with dish liquid and dispense with the press of a button. Features long lasting bristles for a deep clean. Poly fiber. Will not scratch. Cleans tile and grout. Curved tip works into crevices and corners. For tile floors, baths, countertops, and backsplashes. Convenient hang hole. Cleans glass, nonstick cookware and bakeware, sinks, kitchen and bathroom surfaces. Holds shape and won't rust. Will not scratch or mar most surfaces. Typically used on glass, ceramic, china, porcelain and Non-Stick pans. White/blue. Sanitize in the dishwasher and reuse. Gently cleans without scratching. Gentle on glass & crystal, but tough on grime. Ideal for surfaces in your kitchen and around the home. Sanitize in the dishwasher and reuse. The unique tool design allows scrubber to conform to the curves of your tub. The non-scratch scrubber removes build-up without scratching and the comfortable, lightweight & water-resistant handle makes cleaning your tub a breeze. Designed for use on all ceramic cooktops. Made from safe, non-woven fibers the pads will not scratch and are easy to use. Contains ten 4? x 2.5 pads. Poly fibres that mimic the softness of Tampico. Built-in scraper. Hang-up feature for easy storage.